Starvin’? The Shadows? Cliff Richard? The 60s? Guitarist? Apache? Congratulations if you understood the connections to all of the above. You’re either of a certain vintage, or you have a good knowledge of musical history. Cockney rhyming slang laid claim to him in a hungry way, well before a TV ad put Hank before a new audience of younger people. 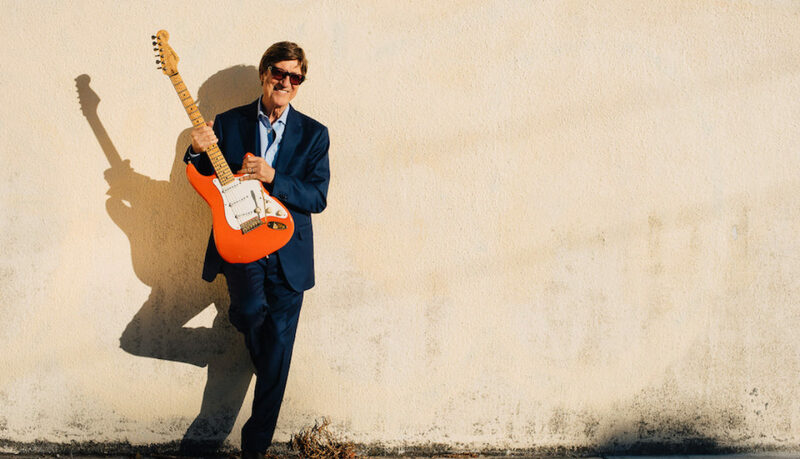 He was also the bespectacled, first ever UK Fender Stratocaster guitarist, with pop band The Shadows, whose classic Hank Marvin sound was made famous on the single Apache. Only Elvis Presley and The Beatles rank higher than Hank (and The Shadows) for UK single and album sales dominance in the last 60 years, his work having spent a remarkable fourteen and a half years in the charts. He was a huge influence on guitarists worldwide, including the man many once considered the ‘god’ of guitar, Eric Clapton. He was also revered by artists such as Dire Straits guitarist Mark Knopfler. Queen’s Brian May, The Beatles’ George Harrison and Tubular Bells creator Mike Oldfield. A recent issue of the respected Guitarist magazine features Marvin as the “Original Guitar Hero”. What many don’t know about him, is his connection to Newcastle, and particularly his connection to the West End. Hank was once called Brian Rankin, born and raised in Stanhope Street (which would in 1957 been thought of as part of Fenham, but is now considered part of Arthur’s Hill). He took the name Hank as a nickname, to distinguish himself from the other Brians at Rutherford Grammar. He adopted ‘Marvin’ later, after a USA blues/country artist Marvin Rainwater (sometimes known as Starvin’ Marvin). The popular music of Hank’s early teenage youth was a sound called skiffle, and he had his own band, as did another lad from Elswick, called Bruce Welch. While still at school, they joined forces and earned themselves, along with their two other band members, a trip to London, to take part in a national skiffle competition. It was a partnership that would revolutionise the sound of British music. They didn’t win, but the London life enticed the 16 year olds. Whilst two of the other band members headed home, Bruce and Hank decided to stay a little longer to see what opportunities the ‘big smoke’ might offer. Relying on the generosity of a Geordie guardian in the city, the two young hopefuls proved their worth. Their professionalism, discipline and creativity led them to be part of the UK’s then top earning act – Cliff Richard and The Shadows. There are no blue plaques to commemorate the enormous impact Marvin and Welch had on the British pop scene. Both of the houses in which they spent their childhoods are now gone. “They demolished slums to build new slums”, said Bruce Welch a couple of weeks ago when he visited a fan convention in Gateshead. There are no statues, or display boards. Although both still have a big global network of fans, their presence in their home city is hardly felt, passing by without a word. ‘Without A Word’, coincidentally, is also the title of Hank Marvin’s latest solo album release, his 16th. The name plays on the fact he uses his guitar instead of a human voice for expression – the traditional ‘Shads’ sound. It contains 14 new recordings, mostly covers of some of Marvin’s favourite tunes, which will be familiar to many. There is also an original track written with one of his sons.